12-Hour Kirtan - July 15th! ~ The Toronto Hare Krishna Temple! 12-Hour Kirtan - July 15th! There is a festive buzz in the air as we prepare for the 39th Annual Festival of India (Ratha-Yatra)! To celebrate this year's festivities, we are thrilled to announce that we will be holding a 12-Hour Kirtan Festival on July 15th, from 10:00AM - 10:00PM. We will be creating a spiritual explosion with kirtaneers from around the world including HH Bhaktimarga Swami, HH Niranjana Swami, HH Gunagrahi Swami, Gaura Mani and of course, Madhava Prabhu! What better way to commence festivities than dancing to your heart's content for 12 straight hours? Since it is a Friday, many will have to take time off from school or work. Don't fret - we have you covered with our unique and creative excuses! Look around the temple for some of these excuses or check our Facebook page here. 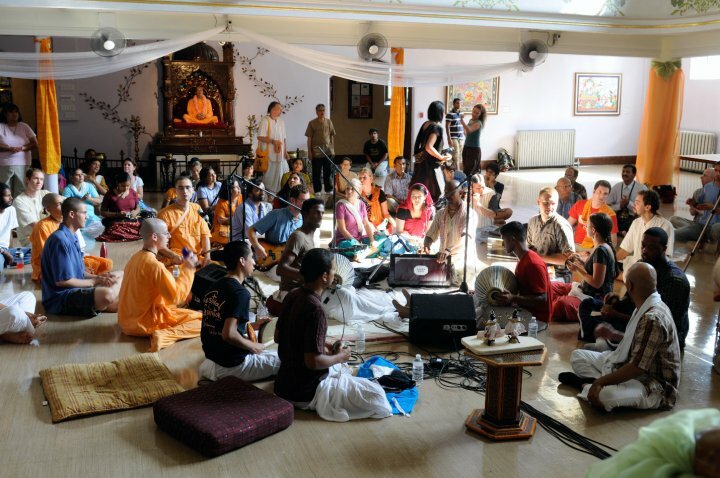 We want to make sure you are here for what will be a wonderful kirtan experience! 7pm - 9pm - Harinam through the streets of Downtown Toronto! Note that the schedule is tentative and subject to change.